Neutralize an ancient forge and put an end to the evil plans of the Dreadhorn Clan. I encountered an escaped captive named Filand who warned me that the Reachmen are kidnapping people to labor at a strange, ancient Forge in this valley. He asked me to help rescue the other prisoners before the Reachmen work them to death, or worse. Talk to Filand inside Bloodroot Forge to receive the quest. Kill the hargraven's creation, Mathgamain. Continue through the Sanguine Veins cavern and kill Stoneheart. 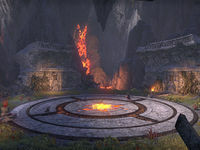 Kill Galchobhar outside the entrance to the Bloodroot Forge. Enter the Bloodroot Forge and continue through it. Speak with Filand to end the quest. Filand told me the entrance to the Forge is through this wilderness, but warned that woods are protected by more than Reachmen. A hagraven keeps watch over this place. I'll have to be on my guard. The hagraven has taken notice of my approach to the ruins occupied by the Reachmen. She has summoned a large creature to block my path. It resembles an animal, but is made from tangled vines and barbs. I'll have to destroy it to pass. I destroyed the large vine creature the hagraven summoned, but the victory was short lived as Filand was snatched away by a harpy and these woods are still crawling with other primal beings under her command. Caillaoife won't let me pass without a fight. The ruins lead to a natural cavern thick with vines and ribbons of blood red rock winding through the stone. Filand said most of the captives are forced to extract the red mineral. I should search for more captives and free whomever I can. Rena Hammerhands, one of the captives I freed, has convinced many of her fellow prisoners to take up the weapons of the Forge and turn them against their oppressors. I should help them as I search for the Forge and the Reachmen behind all this. My way is blocked by a hulking, stone-skinned minotaur who made short work of the rebels attempting to push past him. I will have to defeat the monster if I hope to reach the Forge and put a stop to the Reachmen's plans. I defeated the monstrous minotaur guardian barring my path to the Forge. There I hope to find survivors and the leader of this brutal band, so that I can put an end to the atrocities being committed here. The Reachman patriarch, Gherig Bullblood, is offering blood sacrifices to the Bloodroot Forge to fuel its operation. I must stop him before anyone else loses their life to this madness. I have slain Gherig Bullblood and his attendants, but the bloodshed has stoked some power in the Forge. A monstrosity of fused metal and stone has emerged from it intent to kill. I must destroy this bloodthirsty abomination. Finishes quest The Reachmen and minotaurs are defeated and the Forge is quiet once more. It seems Filand was brought here to be sacrificed. He should be relieved to know he and his fellows are safe. I should see how he's holding up.